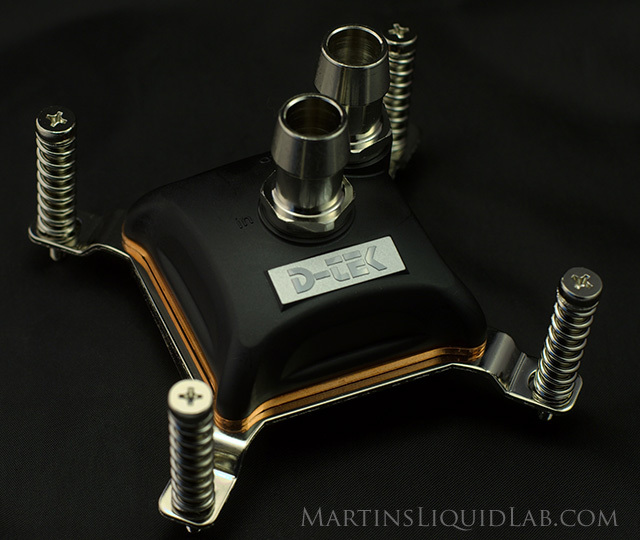 Welcome to my pressure drop and thermal testing of the D-Tek Fuzion V2 CPU water block designed for a wide range of processors. This is an actual production run copy. I would like to give special thanks to Gary from Sidewinder Computers for providing me with a sample to test. Sidewider Computers is one of my favorite places to shop for water cooling gear. They carry a wide range of products and typically the lowest prices. And what is even more important to me, they are very committed to advancements in this industry and are very active in the community. I highly recommend you giving Sidewinder computer systems a visit on your next build! I would also like to thank Daniel from D-Tek for his previous assistance with my GFX review. That was a test I ran with another forum member's GFX block that unfortunately resulted in a pin breaking on the base (likely my own fault for cleaning too abruptly). 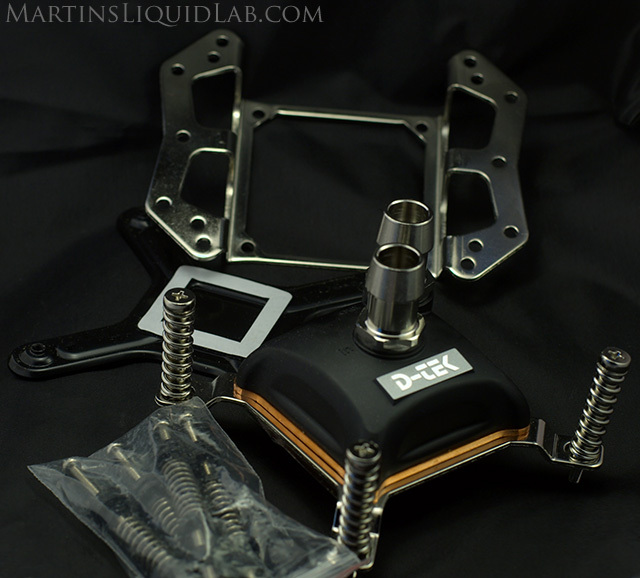 I ended up buying that block from the forum member, and D-Tek sent me a brand new base, no questions asked. That means alot to me in showing D-Tek's high level of customer service, and I would highly recommend them for that reason alone. They are also very well know for the Fuzion series CPU and GPU blocks and have been designing waterblocks for a very long time. Their extensive experience is very apparent from the long term placement amongst the best performing blocks out there. The block is a cast copper micro round pin base design that is very well known for it's extremely strong performance in the Fuzion V1. 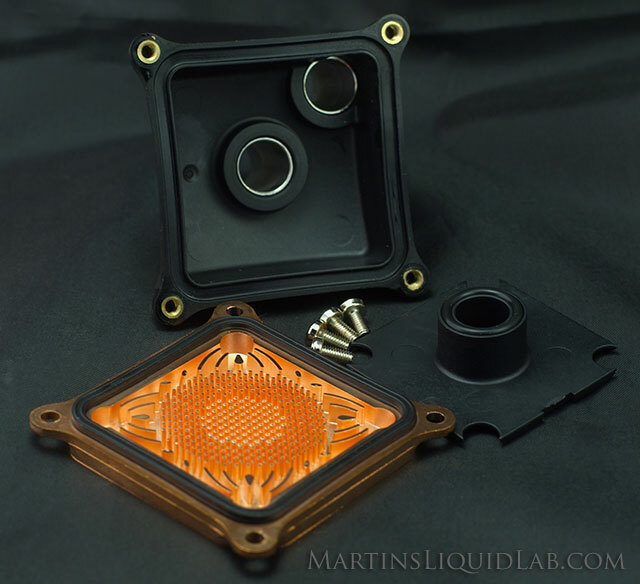 The top and midblock are cast delrin which is a very popular and durable material for water block production. The V2 also now has the middle block fitted within the top block (insert) without the need of an exterior gasket like V1. So the overall block has been simplified, you now have the copper base, gasket and top block, the middle block is now sort of snapped into place into the top block. The new V2 has made some appearance modifications. 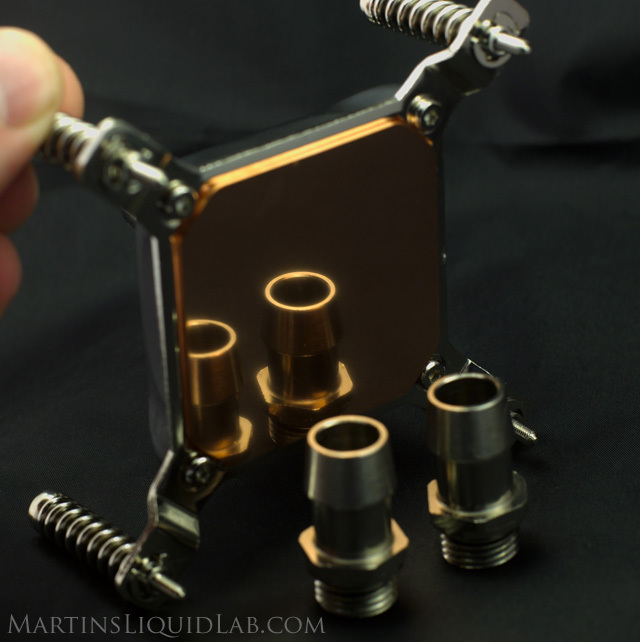 With the all internal configuration of the midblock, you now have what appears from the exterior as a single block on top of the copper base. D-Tek has also made the block lines less blocky and a bit more round. In addition as part of this change, the hold down plates are now all bottom mounted. The parts included were the block with pro-mount preinstalled, the universal hold down, back-plate!, and studs/springs/washers/nuts. In my testing I believe having the hold down plate bolted on, provides better consistency between mounts. I found the universal hold down of the V1 was more difficult to ensure a nice level mount. While I prefer the new pro-mount, I did not use it in my test because by design(using the preinstalled screws), it requires you to remove the motherboard every time and it's essential in testing that motherboard removal is not required for speed. The pro-mount comes with springs and screws to bolt through and thread into the back-plate that's provided. I really appreciate the new bottom affixed hold down designs, great improvement over V1. The Base is nicely finished, straight edge shows it is very slightly bowed. The base is nicely finished and using a straight edge with a strong backlight the base does very slightly bow when tightened down. My only issue with the bottom side is the flat head allen screws used. They are fairly loose on a 2mm allen wrench, nothing that can't be replaced, but be careful. The new V2 adds an integrated o-ring into the midblock to prevent any internal leaks between the midblock and top block (this is an improvement over V1). In addition the perimeter gasket provided was clean and tidy (improvement over V1). The base is cast round micro-pins with perimeter channels, similar but slightly different from V1. Quality is very good. Upon initial inspection of the new V2 base I first noticed that they are now machine finishing the top of the block (note the faint machining marks in the above photo). This should provide a more level and true surface for the gasket to seat upon and removes any casting roughness at this critical sealing area. Visually I really couldn't see any other differences, but using calipers brought forth more than meets the eye. To break this down, I've created the next section that outlines the differences between the two blocks that I noticed. So in addition to the cosmetic changes, there have been a rather significant number of other physical changes, some of which are just simplifying the design, but many of which are performance optimizations. The quad nozzle is the least restrictive nozzle of the bunch. This is intended for quad core users (I will try this soon on a quad processor upgrade). Just slightly lower restriction than the EK Supreme or Aqua Computers double impact. 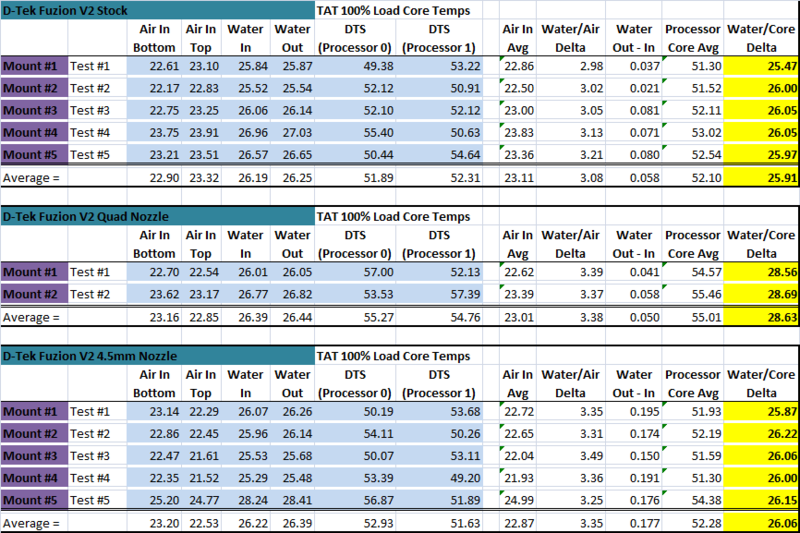 I tested this nozzle thermally for my E6600, results below. LOWER IS BETTER, V2 is about 3.7X more restrictive than V1. 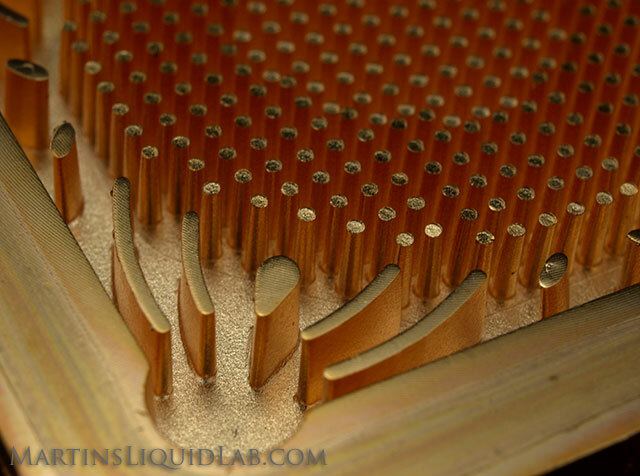 The new V2 with the shorter pins and sealed mid/top block is approximately 3.7X more restrictive than V1. It's still not high restriction, but it definitely is more of an average restriction compared to the low restriction of V1 without washer. 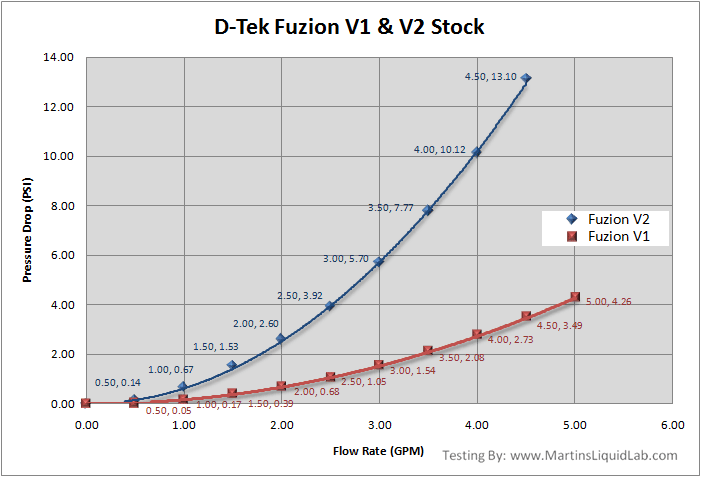 The D-Tek Fuzion V2 stock is now very similar in restriction to the Apogee series blocks. So overall the smaller nozzles are roughly the same restriction in either block as the nozzle becomes the significant restriction dominating the result. Some of the results however are swapped around like the 6.3mm nozzle, I suspect it may be the nozzle in the V2 result was not sitting entirely flush. One thing I noticed in testing the nozzles in the V2, the nozzles were not quite as snug as the V1 midblock so it was more difficult to make the nozzle sit down properly. Adding nozzles does increase restriction quickly. For example somewhere between the 4.5mm and 5.5mm nozzle is roughly equal in restriction to the high restriction blocks like the EK Supreme, Aqua Computers double impact, etc. Here is a look at all of the nozzles tested along with the Aqua Computers double impact and XSPC Edge Acrylic for reference. 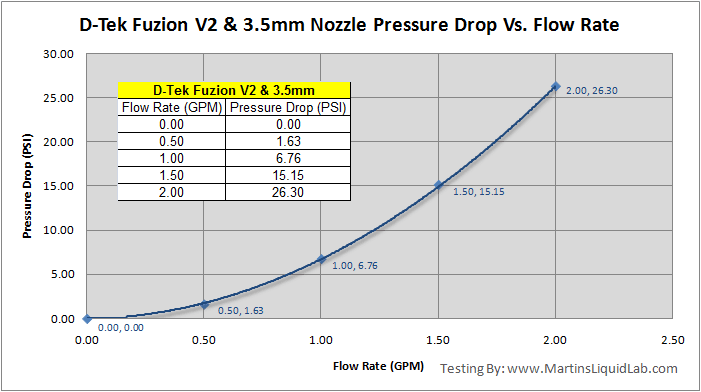 The V2 allows you to have an average to extreme restriction setup depending on the nozzle selected. The 4.5 and 3.5mm nozzles are very restrictive and probably best suited for experiments with very strong pumps such as dual pumps or Iwaki RD-30s, you really need alot of pumping power to push through these nozzles. For a quick test of the nozzles, I tried the stock block, quad nozzle, and the 4.5mm for testing which you can see in the following thermal section. The 4.5mm nozzle was rumored to be one of the better nozzles on the V1, and the quad nozzle was just more of an experiment. 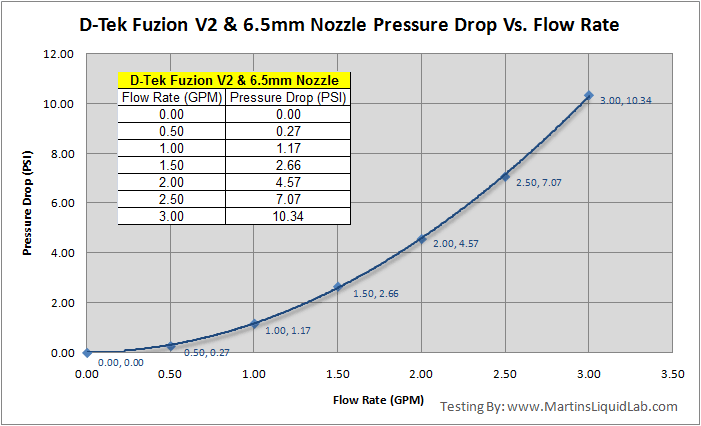 Try out the V2 and nozzles in my updated Flow Rate estimator here. 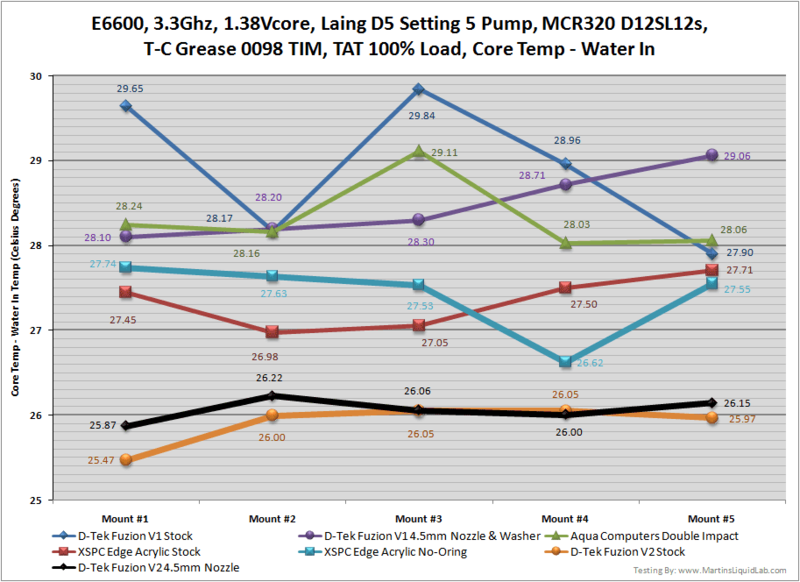 TIM Material - TIM Consultants T-C Grease 0098- I wanted an easy to use past that performed well, and the T-C grease is the best I've used that cures almost instantaneously and it provided performance that was a good 3 degrees better than arctic ceramique in my initial tests. I used a thin layer method over the core area since the compound comes in a small bottle as opposed to a syringe. This is excellent TIM compound and I figured the better the compound, the more consistency in mounting which is very important in testing. The more I use this compound the better I like, I would highly recommend trying this compound, it provides very good results and comes in either a small jar or your typical syringe style applicator. Same mounting hardware. I used 6-32 studs, nylon washers, and thumbscrews from a Danger Den mounting kit that I like. Each mount was done horizontally with the MB laying flat for good centering and the block was mounted with the thumbscrews. I am now using Danger Den springs which when measured on my scale fully compress at just over 9lbs of force. Each of these springs is tightened until just past being fully compressed so the overall block pressure is roughly 40lbs of force. First up is the performance Tables for the Fuzion V2, this includes the 5 mounts that were tested for both the stock fuzion V2 as well as the V2 with the 4.5mm nozzle. I didn't inlcude the results in my line graph, but you can also see I tested the quad nozzle for two mounts worth before giving up on the idea, it's clearly not something you want to use for a dual core processor (quads only). As you can see my ambient temperatures vary alot, but carefully logging all the temperatures including water temperatures and only comparing the difference between water/cores appears to correct for that very well. 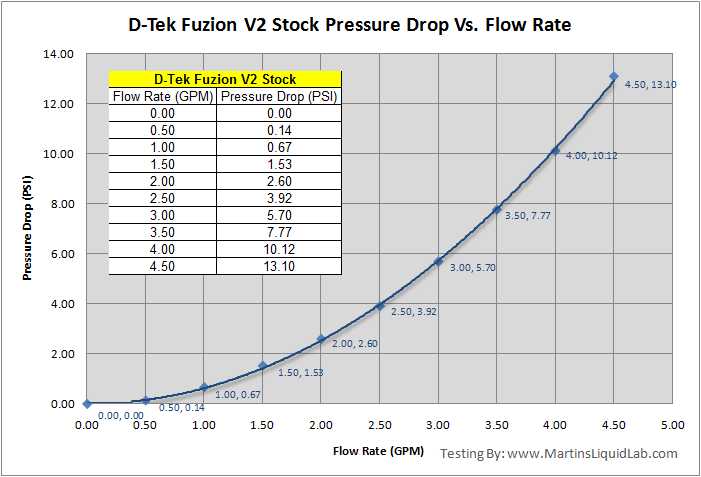 If you are interested in my other block tests tables, I have those tabular results posted here including the D-Tek Fuzion V1, the XSPC Edge Acrylic, and the Aqua Computers double impact. The average core temperature differences overall seemed to be close enough, typically one core would be 3 to 4 degrees cooler, but that chaged over several mounts so I believe this is more of a variance from windows tasking one processor more than the other than cooling. The overall average between processors was roughly within one degree when averaged over 5 mounts so there's not really any preference to cooling one processor more than the other from what I could gather. Water In vs water out temperatures remained fairly low with the stock and quad nozzle, but as you can see the 4.5mm nozzle and extreme restriction did result in some increase, still very small, but consistent with the pressure drop results. Mounting consistency is very much improved on the new solidly attached hold down plates. 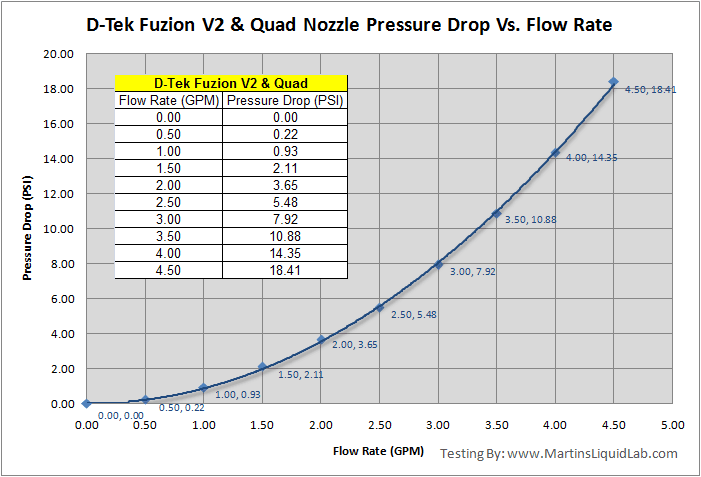 So there you have it, the new D-Tek Fuzion V2 is performing extremely well on a lapped dual core processor. I also did not see any measurable benefit from using the 4.5mm nozzle, the net difference was .17C higher temps using the nozzle, but that's within mounting deviations of testing using 5 mounts. It's possible there could be a very small gain, but it was not measurable using the 5 mount method and the particular pump I used. I initially intended to try more nozzles out and zero in on an ideal for this pump, but I questioned the value after seeing the 4.5 and quad nozzle was not showing a measureable difference. 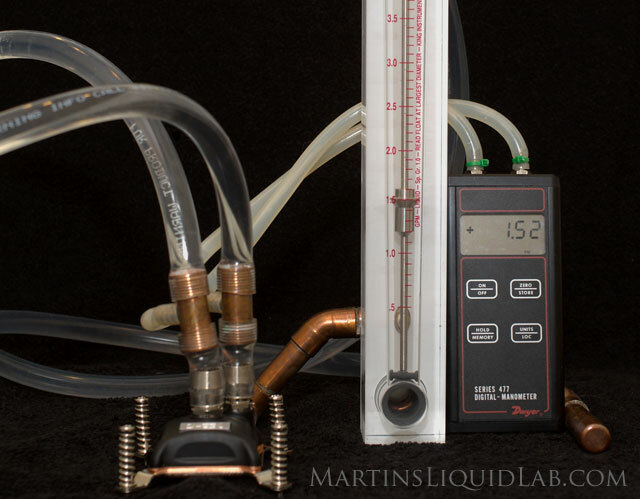 Using a dual core processor and pump similar to a Laing D5, I would simply recommend using the stock block. 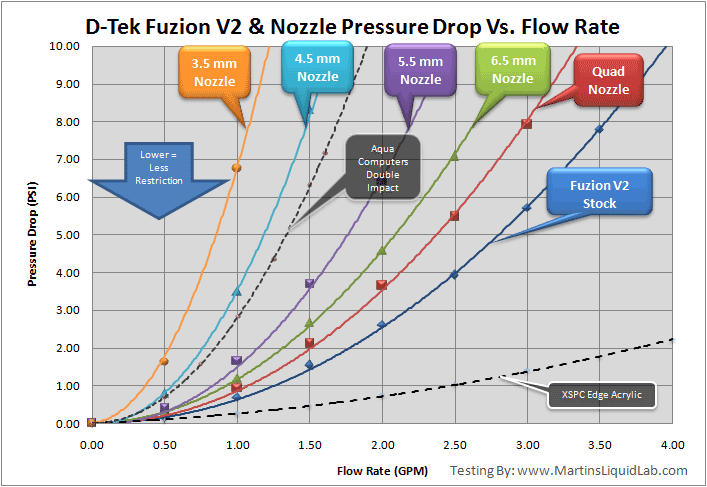 Perhaps with a really strong pumping system or quad cores, the nozzles have a more measurable improvement. I would still encourage people with different pumping systems or different cores to experiment with nozzles, I've only been able to show you how it reacts with my particular setup. If I had an Iwaki or running dual pumps in series I think it would be worthwhile trying some of the smaller nozzles, quad cores I suspect the quad mid plate may work best. What about more bowing, a thicker o-ring? I am currently working some runs to check what happens if the stock o-ring is replaced with a larger/thicker o-ring. The first few mounts are not showing any measurable improvement, so I suspect using a flat lapped processor does not benefit from this mod. If your IHS is convex or wavy, it may show some gains from doing so, but so far I can not see improvement on my lapped flat processor. 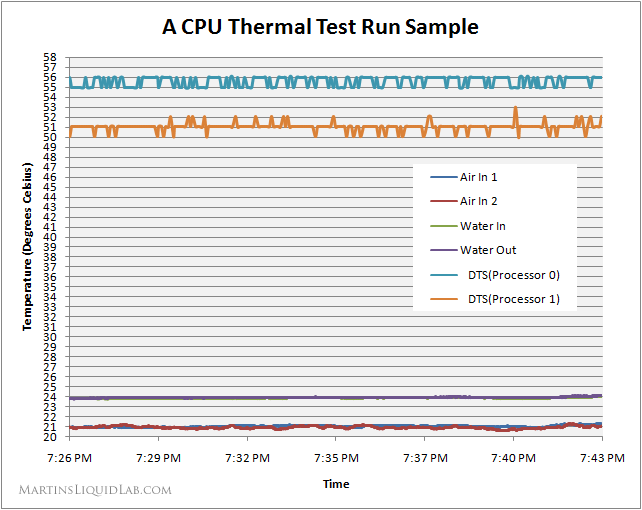 The best dual core processor thermal performance tested to date. Based on the previously outstanding D-Tek V1 block, but improved. 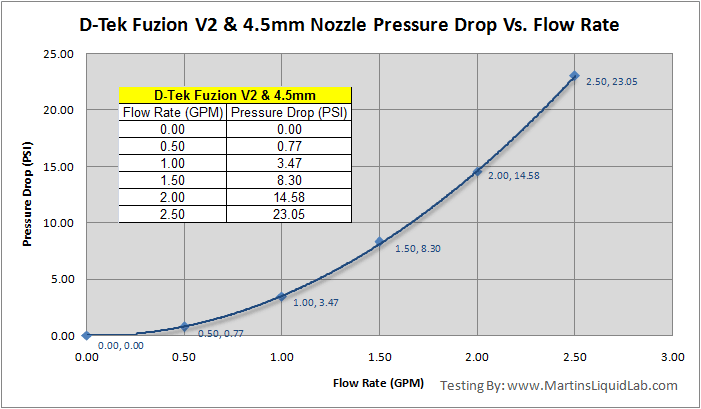 Average Restriction without nozzles - Considering the high thermal performance, restriction is still fairly small and would perform well in many setups. Attached Hold Down Plate and Pro Mount included - Makes installation easier and provides more consistently good mounts. Back-plate is INCLUDED!!! VERY NICE!! High quality oversized D-Tek barbs with o-ring retainers to prevent o-ring displacement. High quality fabrication, overall quality is superb except for the base screws. Easily Stripped Screws - I had trouble and had to be extremely careful with the bottom allen head screws, I would suggest replacing them if you plan to take it apart very often..
Average Restriction - 3.7X more restrictive than the V1 without washer. Very restrictive when combined with smaller nozzles. Extra accessory costs not included. Nozzles and quad midplate must be purchased separately. 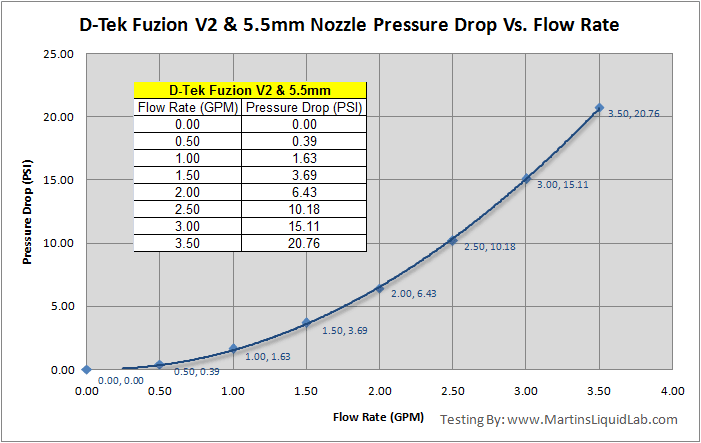 Nozzle performance not measurable in tested setup - 4.5mm nozzle tested did not perform better than stock. The new D-Tek V2 may at first look like a minor cosmetic top upgrade which would be acceptable considering how well the V1 performs, but it's much more than that. D-Tek has spent a fair amount of time taking all the good from V1, building upon that work and making it even better for the new version. The thermal performance gains in the new version over V1 were surprising to me, and exceeded my expectations...I'm impressed! The V2 performed almost 3 degrees better in stock form than the V1 did stock, that's a very substantial improvement! It is now more of an average restriction block, so it's no longer extremely free flowing as it once was. Overall the V2 fixes all of the little things that the V1 missed, and the only downside left is those base screws. 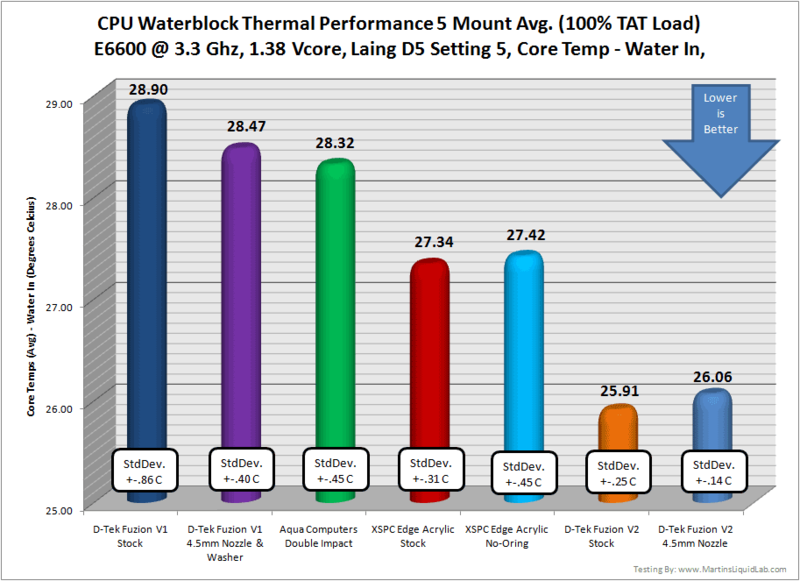 For dual core processors, the D-Tek Fuzion V2 in a single CPU only block loop will afford you the best thermal performance, it is superb and I would recommend using the block stock without nozzles. 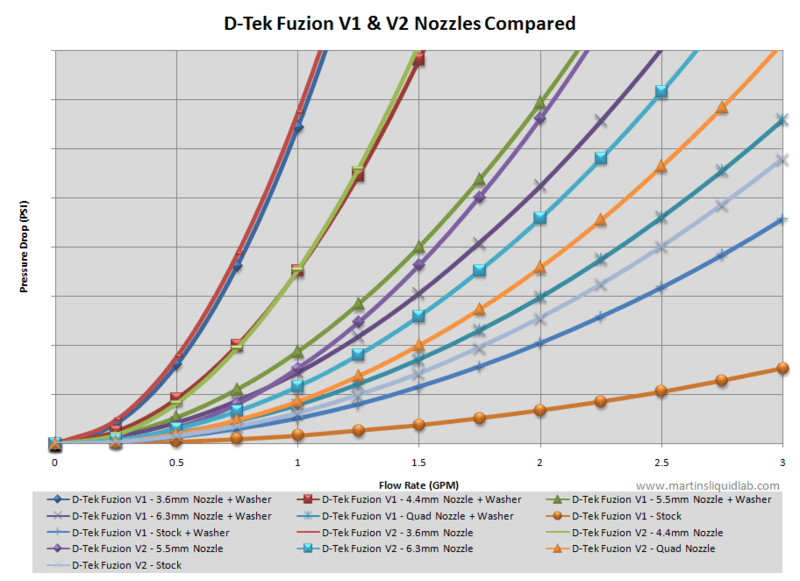 The D-Tek Fuzion V2 is the best thermal performing block I have tested on a dual core processor.